Holbelin the younger’s biography is long and extent, so I’ll just do a basic and concise historical introduction. Son of another artist (of course, Hans Holbein the elder), Holbein is born in Germany, in that time, part of the Holy Roman Empire. However, he begins painting, under the look of his father, in Basel, Switzerland. There, with 17 years, Holbein is commended with a portrait of Erasmus of Rotterdam, theologist, priest and author of the well-known book The praise of folly. From that time, Holbein the younger becomes famous, apart from his father’s name. Recommended by Erasmus, Holbein visits England and begins to portrait characters of the rich families. Among them, he portraits Anne Lovell, our Lady with a squirrel and a starling. Á la Frida Kahlo, the animals chosen seem bizarre, but we have to know that squirrels, in that time, were common pets among the English upper class. If you look closely, you’ll notice the little chain that stops the squirrel from escaping and that Lovell holds in her right hand. Also, it is thought that the squirrel is a reference of the Lovell family name, as this little animal is in their coat of arms. 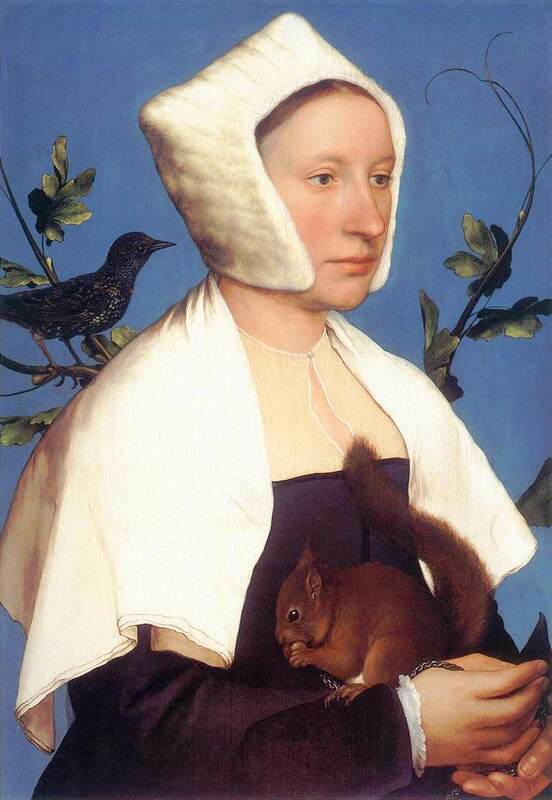 But more interesting that the squirrel anecdote is the fact that Holbein, formally, belongs to what is called the “northern renaissance” movement. But of course, renaissance per se wasn’t that influential in German countries as the gothic art, style that survived since the 12th century. It would seem like Lady with a squirrel and a starling to be a spectacular synthesis between the renaissance and the gothic. Many compare this paintings to Leonardo’s portraits, however, the clothes and the cold, livid and strict look the of woman remind us the gothic paintings; and the squirrel, joyful and playful, contrasts with Lovell’s impassivity. ~ by Álvaro Mazzino on November 12, 2010. This entry was posted on November 12, 2010 at 13:07 and is filed under Renaissance.You can follow any responses to this entry through the RSS 2.0 feed.You can leave a response, or trackback from your own site.